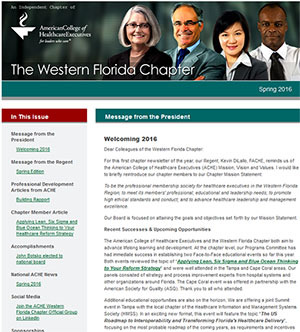 Western Florida Chapter ACHE Members considering Fellowship! To help you take the next step in your career and earn the prestigious FACHE distinction, all four Florida ACHE chapters have partnered to offer a one-day, low-cost Board Exam Review in Orlando during the Florida Hospital Association Annual Meeting. Participants will receive a comprehensive study binder. Paula Zalucki is a Fellow of the American College of Healthcare Executives and a seasoned BOG Review Course Instructor. She has earned the distinction of Exemplary Service for ACHE, the highest level of volunteer service in recognition of her participation in both governance and educational programs for the College. The review is divided into two sessions, one on the afternoon (12PM) of Thursday, August 30 and the second half of the review occurs the morning (8AM) of Friday, August 31.